“Filing Analytics has proven to be a time saver and an efficient way to gather information regarding level of reciprocity, technology breakdowns, and upcoming potential national stage applications in advance of client development meetings." Cahn & Samuels, LLP is a US based intellectual property law firm that embraces all areas of intellectual property matters including patents, trademarks, unfair competition, copyrights, trade secrets, licensing, Internet law, government funding agreements, and litigation. The firm represents a broad range of clients, from individual inventors, small technology start-ups to Federal laboratories and Fortune 50 multi-national corporations. Prior to attending a major IP conference, patent attorneys can often be inundated with meeting requests from other law firms who want to explore filing reciprocity partnerships. A key challenge for Cahn & Samuels was trying to identify from the many invitations received, which law firms would be the most beneficial to meet with at the conferences. A decision that can be difficult when you don’t have access to a law firms patent filing history, or know how many upcoming filings they may have in their business pipeline. Many of their meetings with other law firms at the conferences often resulted in minimal business returns for Cahn & Samuels. Filing Analytics provides law firms with exclusive IP intelligence to help discover which applicants and law firms have tangible business opportunities in their pipeline. It shows the filing history and strategies of applicants and law firms worldwide and their upcoming filings. Users can easily see which domestic and foreign law firms and applicants have tangible business opportunities in their pipeline. A key factor when determining who to meet with at IP events. 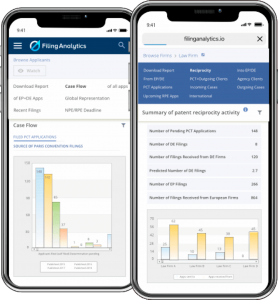 Using Filing Analytics, Cahn & Samuels can now search for any law firm (or applicant) and easily see the patent filing history and the amount of the upcoming filings they have in their business pipeline. Crucial business intelligence that gives Cahn & Samuels the business insight they need to make strategic and informed decisions when establishing business reciprocal partnerships. With Filing Analytics Map Explore feature, Cahn & Samuels can view top law firms or applicants ranked by filing numbers in the geographic location that they plan to visit. Now they can maximize their business trips by scheduling meetings with law firms that they know have filings in their business pipeline for Cahn & Samuels to obtain. In addition, with the Filing Analytics mobile app they can pull up the information they need anytime, anywhere, at an IP event, in a meeting or at the airport! Cahn & Samuels now have the latest IP business intelligence they need to set up meetings with potential clients that are not only a relevant technology match with their law firm, but also ones that can give Cahns & Samuels tangible revenue growth with reciprocal filings.